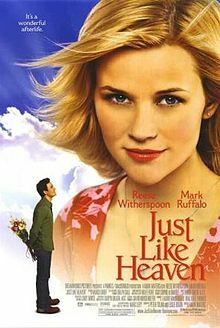 Just Like Heaven is definitely one of my favorite romantic comedies. Set in San Francisco, with Reese Witherspoon and Mark Ruffalo in the two leads, this movie is a unique take on death, coma, spirits, etc. I really loved the way the story was brought to life and I think my DVD has been worn out after multiple viewings, LOL. Has anyone else seen this? If so, please post your thoughts and have fun! By far one of my favorite romantic comedies. A guilty pleasure of mine. It's the type of movie that gives you enough laughs and enough tears just the same. I feel like this movie doesn't get enough credit. Most of the times when I mention this movie nobody has actually ever watch it. I certainly recommend it to anyone that loves a good romantic comedy. Both the leads delivered their performances really believable. ^ Yay for another Just Like Heaven fan! I don't know why this movie is not that well known either. In my humble opinion, it's by far one of the best romantic comedies to light up the silver screen. I just loved Reese Witherspoon as Elizabeth and Mark Ruffalo as David. They had wonderful chemistry and delivered an unconventional and poignant love story to perfection! This is one of my all time favorites too and I don't know why it is not far more famous and popular??? It was brilliantly write and brilliantly acted. As mentioned, the movie is a perfect balance of make you laugh and tug at the heartstrings, and the two leads really did a whole range of emotions very, very well. Yeah, I heard that Mark Ruffalo spent a lot of time watching mimes so that he could get that scene in the bar right. It definitely paid off, since it was awesome! Glad to see you're a fan of this movie too, imagineer! This film was just really cute and lovely. I like it a lot and I'm also not sure why it isn't more popular.